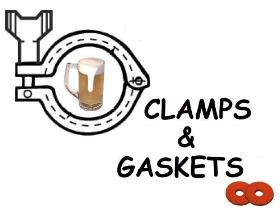 Clamps & Gaskets: News Roundup for Weeks 26/27, 2015. Why John Adams believed that July 2nd, not July 4th would be American Independence Day. "The feel is of a welcoming insider showing a newbie the ropes." 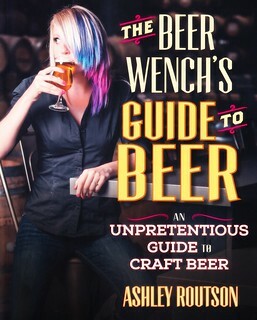 A review of the new book by Ashley Routson, "The Beer Wench's Guide to Beer." Nicholas Winton, English rescuer of 669 Czech children during the Holocaust, dies in England at 106. Eric Wallace, owner of Left Hand Brewing Company —a Longmont, Colorado, brewery he co-founded in 1993: "No way I am going to sell out for a bunch of money." Wallace sells majority of brewery shares back to employees. The (U.S.) Brewers Association has created an on-line database of laws concerning beer sales and sampling laws in breweries and brewpubs, for all fifty U.S. states. An appreciation of Dan Bosserman (1949-2015), long-time 'craft' beer distributor in Maryland and Washington, D.C. The tourism office of Howard County —a Maryland suburb of Washington, D.C.— creates a county beer-trail mobile app. Clocks read 11:59:60 as extra "leap" second is officially added to world time, allowing the Earth’s slowing rotation to catch up with atomic time. Influential, fast-growing Scottish 'craft' brewery, BrewDog, to open a new brewery near Columbus, Ohio, in the United States, in 2016, its only brewing facility outside of the United Kingdom. The state of South Carolina is offering tax breaks and other financial incentives to lure away 'craft' brewery, Terrapin Beer Company, from its home in Athens, Georgia. 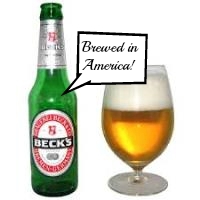 Since 2012, Beck's sold in the United States has been brewed by Anheuser-Busch InBev in St. Louis, Missouri, USA, not in Germany. The brewery settled a class-action lawsuit, and will change wording on the packaging to clearly indicate American provenance. The Beer Price Index: how much a beer costs in various cities across the world. Geneva, Switzerland, is the most expensive city for a beer: $6.32 per 11.2 ounce beer.
" No union is more profound than marriage, for it embodies the highest ideals of love, fidelity, devotion, sacrifice, and family. In forming a marital union, two people be-come something greater than once they were. As some of the petitioners in these cases demonstrate, marriage embodies a love that may endure even past death. It would misunderstand these men and women to say they disrespect the idea of marriage. Their plea is that they dorespect it, respect it so deeply that they seek to find its fulfillment for themselves. Their hope is not to be condemned to live in loneliness, excluded from one of civilization’s oldest institutions. They ask for equal dignity in the eyes of the law. The Constitution grants them that right. " Reduce the federal excise tax to $3.50 per barrel on the first 60,000 barrels for domestic brewers producing fewer than 2 million barrels annually. Reduce the federal excise tax to $16 per barrel on the first 6 million barrels for all other brewers and all beer importers. Keep the excise tax at the current $18 per barrel rate for barrelage over 6 million. Both the Beer Institute and the (U.S.) Brewers Association support the bill; in the past, both had supported competing bills. "You could be reading a lot soon about soaring hop prices." The 2015 Barth-Haas Hop Report. Quotable quote. Larry Bell of Bell’s Brewery: "We are in the middle of the end of the beginning of craft beer." Anheuser-Busch InBev's 'craft' brewery acquisitions are unsettling the craft movement. A profile of Andy Goeler, CEO of craft beer for AB InBev’s Anheuser-Busch division. The Affordable Care act (aka Obamacare) survives a second challenge at the U.S. Supreme Court. In King versus Burwell, by a vote of 6-3, the Court decides that subsidies should be available across the entire U.S. Symposium held during SAVOR week near Washington, D.C. asks: What defines a 'craft' beer? Participants answer, "It all comes down to motive with quality." 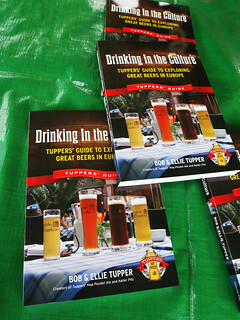 Bob and Ellie Tupper, long-time observers and chroniclers of good beer in the Washington, D.C. area, release their first book: "Drinking in the Culture: Tuppers' Guide to Exploring Great Beers in Europe." Forty U.S. 'craft' breweries have signed the Brewery Climate Declaration, since March 2015. "Finding innovative ways to integrate sustainability into their business practices and finding economic opportunity through investing in renewable energy, energy efficiency, water efficiency, waste recapture, and sustainable sourcing." "There's no sense trying to start a revolution if nobody wants to follow." Jim Koch of Boston Beer Company (maker of Samuel Adams beers, etc.) is profiled on his role at the beginnings of 'craft' beer, over thirty years ago. Twenty-one of the world’s thirty-seven largest aquifers have passed their sustainability tipping points, meaning more water was removed from them than replaced, during a decade-long study period, a NASA report states. YFGF has been remiss: Clamps and Gaskets has fallen several weeks behind the calendar. Until things are set right, there will be a weekly —not bi-weekly— update. Is it good news or bad news for U.S. hops? Pic(k) of the Week: Fobbing at the tut. Virginia to celebrate Craft Beer Month in August. Please read: A brewer needs your help. Cask ale production in the United States?